An artist copying an existing work paints differently to one that's creating something new, according to Serbian computer scientists who've developed an algorithm that can tell the difference between the two. Milan Rajkovic and Milos Milovanovic reckon that machine vision analysis techniques are now advanced enough to detect the subtle signs left behind when an artwork is copied, even if it's the original artist doing the copying. They commissioned a Dutch artist to create seven artworks, then copy them as closely as possible a few days later. They then examined the red, green and blue channels using 'wavelet analysis' - a process where the computer looks at progressively more blurred images. From that analysis, the researchers were able to tell which paintings were more complex. "For all patches and all the paintings, the mean global complexity of an original painting is larger than the corresponding value of a copy," they said. 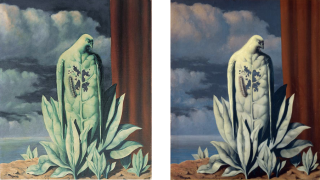 Then, the pair went on to use the technique to analyse a pair of near-identical paintings that experts believe were both created by 20th century surrealist René Magritte and have puzzled art historians for decades. They have identified one as an original and one as a copy - but which is which? Entertainingly, they're not saying. The pair published the details of the algorithm in a paper on the pre-print ArXiv server.